A couple of days ago over on Twitter, I theorized that, now that the trend in 80's remakes and 3D movies seems to be dying, the next course of action for Hollywood should be to Mementoize 80's films. That is, remake an 80's film in reverse, starting with Esooltoof. ErinGoBawl: NOITCARTTA LATAF, the dramatic tale of a woman rising from a watery grave and falling for her murderer's husband. Brock Wilbur: SRETSUBTSOHG: Stantz, Spengler, and Venkamn lose their black friend and go back to NYU when job market dries up. Dill the Devil: POT EHT REVO: Guys eventually pulling out of intense, sweaty handshakes with Sly Stallone. Ace. Anyway, I thought I'd turn that idea into a comment diversion, and to up the ante, I'm giving away one of our brand-spanking new Pajiba T-shirts to the best reverse 80's remake (or, really, any decade of remake will do). Taking a fantastic Pajiba tagline that Joanna came up with in a Pajiba Love, "We Built this City on Mock and Droll," our friend and illustrious Eloquent, Protoguy, came up with a design, and combined the two to create a fantastic T-shirt. 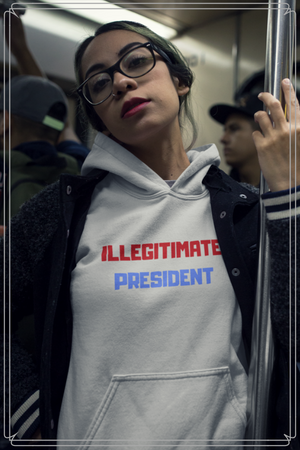 In fact, you can buy one now over on Zazzle in a variety of sizes, colors, prices, and T-shirt brands (I recommend the American Apparel, but buy one size too big because they shrink). You can even buy a Pajiba coffee mug, if the mood strikes you. And know this: Wearing a Pajiba T-shirt has shown to have a statistically significant effect on your ability to get laid (I will not disclose if it is a positive or a negative effect). It has also proven effective in confusing family, friends, and co-workers, who will mangle the pronunciation, giving you an opportunity to yell at them. It's also a good conversation starter in church. So, please: Buy a Pajiba T-shirt. They make great Christmas gifts. And if you can't afford one, win one with the best Reverse Remake idea.